On Tuesday, December 4, 2007, I went to see a conference organized by Infopresse. The subject was 'Design Tendencies' (Tendances Design) and was composed of 4 lectures. The conference's highlight was Stefan Sagmeister, who presented the work of his company Sagmeister Inc. His talk was divided into four areas that he has been working on: 'design for music', 'socially responsible design', 'corporate design', and 'we are the authors'. He argues, that the areas he concentrates on in his design work are subjects he is really interested in. The following project was an initiative against U.S.military expenses. For the organization truemajority, which was founded by 500 business leaders. A promotional device in form of a pen has been created that contained an informational sheet, which compared high military expenses as supposed to low education. Sagmeister inc. also used cars to promote their message. These cars toured through many U.S. cities and Stefan Sagmeister pointed out that this promotional method did not cost more than a one-day ad in the N.Y. times. Sagmeister also presented the Zumtobel annual report of its lightening systems company. A plastic shape of a light, which was placed on the cover, was shoot in very different lightning situations. These were used inside the annual report. 'Everything I do comes always back to me', 6 Pages in a magazine published these words. Trying to look good limits my life, realized by photo shootings in the south of the states by building sculptural words in the envirnoment. 'Everybody thinks they are right', a group of businessmen pie this sentence in the sky. 'Helping other people helps me', this sentence is build using single words that are placed in different Scottish cities. 'Complaining is silly, either act or forget', specially prepared posters are set up on billboards in Lisbon. Sun is supposed to alter the posters, which eventually become empty billboards. 'Drugs feel good at the beginning, bad after', one shown element shows a snake sliding over a razor. ‘Being not truthful always works against me.' Being not truthful installation: Once the participant comes close enough to the screening of a spider net, the spider net gets destroyed. Sagmeister tries not to use logos to avoid altering the meaning of his design work. Nevertheless, for the catalogue of N.Y. fashion designer Anni Kuan he put the Logo – an exception maybe because she is his girlfriend. He also mentioned that he used to take a year off. I asked him what he could explore during this year. He said it shaped ideas for the coming years. He also experienced how it feels not to have the clients' pressure. He did not actually come up with a final project. His next sabbatical is planned for autumn 2008, which he plans to spend in Bali. A very inspiring talk, which showed how less commercial design work can be! 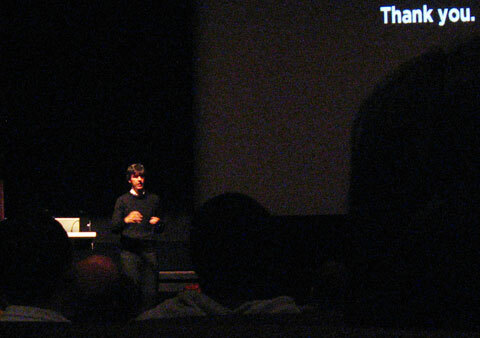 Scott Burnham was also lecturing at the Journees Grafika. He is assigned creative director for the 2009 Montreal Biennale. His work as a curator for Droog Design Urban Play gave him the chance to work all over Europe in Prague, Lisbon, London, Barcelona, Amsterdam and Beijing. In Barcelona he records memories of people who had been lost through AIDS. He likes to integrate people in the creation of a space, and not him opposing his ideas. In one of his projects he asks people to photograph design patterns they'd like for their own space. He mentioned the Graffiti Exhibition at Urbus, a bienual event, which takes place every two years with the performance of 10 of the world’s best graffiti artists. Burnham asks people to rethink the city in collaboration with the Office for Subversive Architecture: Urban Oasis works simoultaniously in 4/5 cities. With a quote by Richard Florida Burnham introduced Gorilla Design projects. Whereas Florida believes that with a certain percentage of creative people in a city the city will transform to a creative city, Will Asop wonders when we actually get to see the creative city? instead of bird stickers, stickers with military helicopters have been put on big glass surfaces. Thruthtagcreates 3-dimensional objects and applies them to architecture in a city. Knitting in the city of Montreal featured by the group Knitta that knits around structures in the city. Arno Piroud puts black stickers with shapes on the actual street lights in Berlin. Cutup rework the existent, they cut ad posters and rearrange them to an image they like. Video Billboards by abstractor. Their mission is to transform a video billboard into art. "In an attempt to broaden the scope of MTA's video art series, Pixelator takes video pieces currently on display and diffuses them into a pleasant array of 45 blinking, color-changing squares." Mark Jenkins creates scotch tape and other sculptures. One space intervention is a merry-go-round with horses. Burnham points out the actual experience of the space in the environment, sitting in a car and driving in a circle gives the feeling of sitting in a real merry-go-round. Burnham mentioned the artist group intervention by graffitiresearchlab "ferromagnetic surface in your neighborhood. A Throwie consists of a lithium battery, a 10mm diffused LED and a rare-earth magnet taped together. Throw it up high and in quantity to impress your friends and city officials." At the example of china Burnham showed that inspirations deriving from the margins of the city lead to actual design trends. Contemporary Chinese artist, Ai Weiwei, was inspired by chine buildings, where construction workers closed open window spaces with woods when designing Beijing National Olympic Stadium. The stadium designed by Ai Weiwei uses similar structures. Gabriel Poirier-Galarneau was presenting his work. He is a motion designer at toxa / urbania and talked about his motion design profession, which unites at the same time conception, production, design, editing, animation, illustration, photography, graphic design and technician. And Vanderlei Caballero, design director at electronic arts. showed his parts of his work which is situated in the game industries.